Well renowned slot developer Realtime Gaming (RTG) have long been synonymous with slots that have been enjoyable and fun enough but have not quite lived up to the same standard of graphics as other slots by developers such as Scandinavian-based developer NetEnt or 3D slot developer Sheriff Gaming. The game has now officially changed with the release of this new 3D slot from RTG called Orc vs Elf that will strike a chord with any fan of fantasy themed slots such as the epic The Lord of the Rings slot or the Dungeons and Dragons – Crystal Caverns slot. So if you loved those slots or others like them then you will definitely want to give this slot a try. 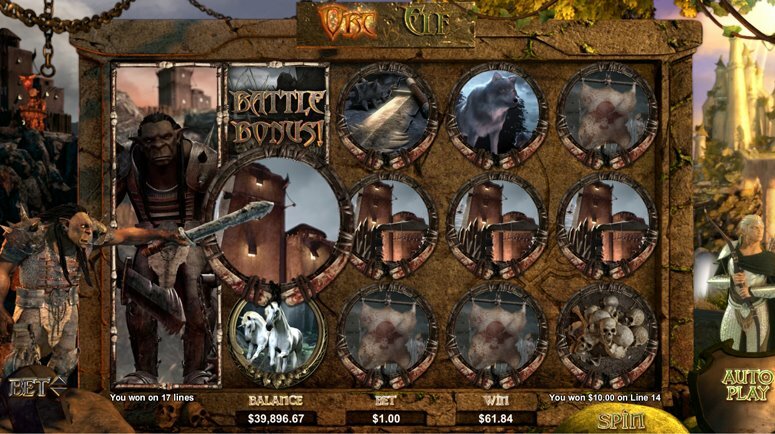 This slot is a 5 reel, 25 pay-line game based on the mythical creatures that have played a regular fixture in the majority of fictional stories that have a fantasy theme since the early days of time. Now, slots players will get to see the two sets of creatures go head to head. There are a range of objects that appear on the reels as symbols such as the Orc shield, Elf shield, unicorns, potions, castles, wolves, skulls, battle flags, flower-shaped broaches and a crossbow. To make the most of the 3D graphics, every symbol will become animated when it becomes part of a winning combination which ensures the reels remain dynamic throughout the game. The great thing about this slot is that it literally is Orc vs Elf. You must choose your side. Will you choose the Orc or will you opt for the Elf? Your decision could impact how much you win. 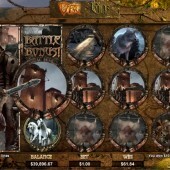 The main feature on this slot is the Battle Bonus. This is triggered when you hit three Bonus symbols across the second, third and fourth reels. You will then witness Orc and Elf do battle on the screen. If your selected character wins then you will win a pay out. The Orcs and Elves are Wild! The Orc and Elf symbols act as the Wilds in this slot. The Orc appears on the first reel only and substitutes for all other symbols except for the Elf Shield Scatters to complete winning combinations. The Elf only appears on the fifth reel and substitutes for all other symbols except the Orc Shield Scatters to complete winning combinations. The Orc Shield Scatters and Elf Shield Scatters also play a key role in triggering a lot of bonus features. Each set of Scatters can trigger one of seven bonus features depending on which path you choose to follow. You can either opt for the Trail of Orcholome or the Road to Elveros. - The Goblin’s Gold where you can win 5 free spins where certain symbols pay out double. - The Hobgoblin Bonus where you are awarded with 6 free spins and if you hit two Orc Shield Scatters across the reels during the free spins then you will earn an additional free spin. - The Orc Army Bonus will see you will get 6 free spins but if the Orc symbol appears then you will be awarded an extra Wild symbol. - The Orc Horde Bonus that will see you win 6 free spins with an extra Wild added to the first reel. - The Giant Spins Bonus will award you with 6 free spins and a number of symbols pay out triple. - The Chaos Spins Bonus gives you 7 free spins with a selection of symbols on the reels paying out 3x when they are part of a winning combination. - The Orc Onslaught Bonus that rewards you with 7 free spins but the final spin will act as a super spin. During this super spin, the Orc symbol will cover reel 1. - The Woodland Spins Bonus which will award you with a standard 6 free spins. - The Elf Magic Bonus that will award you with 6 free spins but you will also see an extra Wild symbol appear on reels 2, 3 or 4. - The Huntsman Bonus which will reward 7 free spins and the Elf will look to kill any Orc symbols that appear on reel 1 resulting in a potential 200x your bet pay out. - The Ancient Archer Bonus is a feature that will see you awarded 7 free spins with the Elf targeting both Orc and Wolf symbols. Killing the Orc will still pay out 200x your bet but slaying the Wolf will also then pay out 100x your bet. - The Archmage Bonus will award you with 7 free spins and 1 or 2 extra Wilds will be added to the reels after every spin giving you huge potential to complete winning combinations. - The Forestal Bonus can reward you 7 free spins and you will earn a free super spin if you hit an Elf symbol across the reels. Three extra Wilds are added after every super spin. - The Elf King Bonus gives you 8 free spins and any super spin you hit by hitting an Elf symbol across the reels will add a fourth extra Wild to the reels after every super spin. Orc vs Elf could perhaps be seen as a game changer for RTG because up until now the developer has not really released slots with the best graphics. I only need to point you towards the below average visual effects of Cleopatra’s Gold and the terribly old-fashioned looking T-Rex. However, RTG has now entered a new realm (not just one that holds resemblance to Middle Earth) with this 3D slot and with more in the pipeline the developer could well have just revolutionized the way it develops slots. There are plenty of bonus features but the only thing letting this slot down is that the pay outs are not as big and not as frequent as you might want. Other than that, I found it to be thoroughly enjoyable and I haven’t been able to say that about an RTG slot… well… in a very long time.